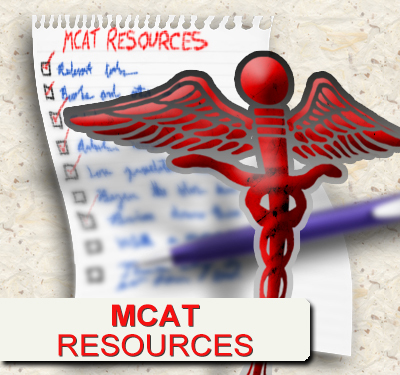 Amino acids are critical for the MCAT as well as your biology and biochemistry courses. Amino Acids are the building blocks of living things playing key roles in cellular structure, function, and so much more. 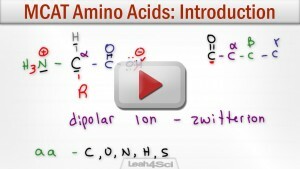 This tutorial series will walk you through the different aspects of amino acids as required for the MCAT. 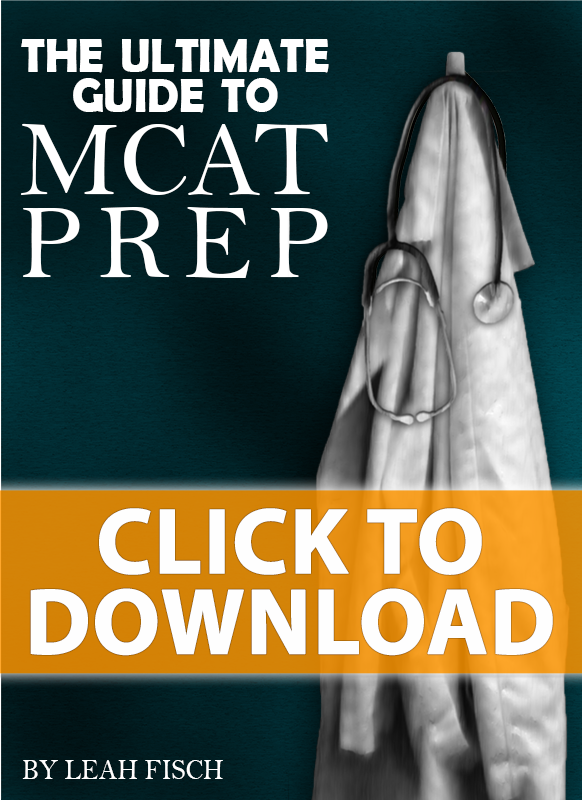 MCAT Amino Acid Practice Quiz linked below. Before you dive in to memorize side chain characteristics, ask yourself WHY? What is so special about this biomolecule? What is the logic behind ‘alpha carbonyl’ and why are there polar and non-polar, acidic and basic side chains. This video will help you set the stage for the entire series. It’s not enough to memorize names and structures. You need to UNDERSTAND how each specific R-group contributes to that groups chemistry and participation in 3-dimension structures and reactions. This tutorial breaks down the side chain groups to help you understand their individual classifications. These amino acids may appear out of place in an aqueous biological environment, but they are in fact critical to completing the amino acid picture. Hydrophobic amino acids feature water fearing neutral and non-polar side chains. 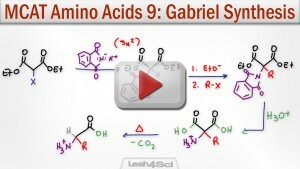 This video explains their names, and side chain functional groups/structure. Hydrophilic amino acids are rather ‘exciting’ and reactive compared to the hydrophobic groups. 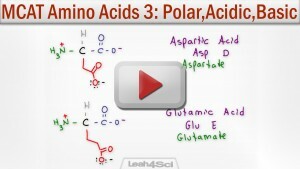 This video walks you through the polar neutral, acidic, and basic amino acids and their side chain characteristics. Ever notice that amino acids are written with both a positive N and negative O in the same structure? Why? 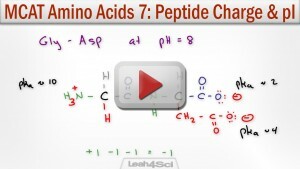 How do you determine the charge of any group within an amino acid or polypeptide? How does all this relate to the Isoelectric Point or pI? Amino Acids are biologically active molecules. 19 of the 20 common amino acids have a chiral alpha carbon. This video shows you how to find R and S on linear molecules and convert them to R/S or D/L Fischer projections. Zwitterion or ‘double ion’ refers to a molecule with a net neutral charge despite wielding a positive and negative charge. 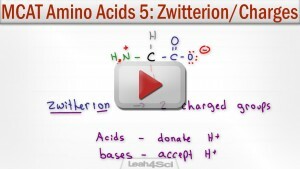 This video shows you how to recognize the zwitterion, how to find it’s ideal pH, and how to find amino acid charge at ANY pH. 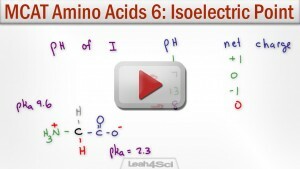 Isoelectric point or pI of amino acids is the pH at which the zwitterion exists. In other words, it’s the pH at which an amino acid has a net neutral charge. 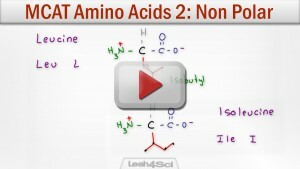 This video shows you how to quickly calculate the pI of amino acids with 2 or 3 pKa values. Calculating the charge or pI – isoelectric point peptides is trickier than a simple Amino Acid charge or pI. This video shows you how to quickly find pI and charge of dipeptides, tripeptides, and even short chain polypeptides. 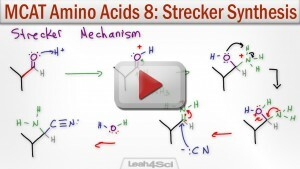 Strecker Synthesis is the earliest known method to synthesis an alpha amino acid. This video walks you through the overall reaction followed by a step by step breakdown of key mechanism components. This is one of the 2 amino acid synthesis reactions required for the MCAT. 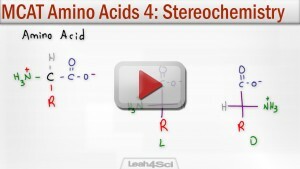 This reaction is another popular method for synthesizing alpha amino acids. This reaction is a combination of the Gabriel Amine Synthesis and the Malonic Ester Synthesis reactions. This video breaks down the overall reaction followed by a walk-through of key mechanism components. This is the second of 2 amino acid synthesis reactions required for the MCAT. 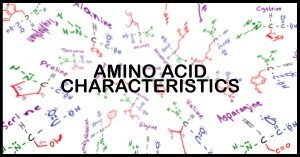 Amino acids are the building blocks of living things. This makes the process of making/breaking bonds critical to understanding biological sciences. 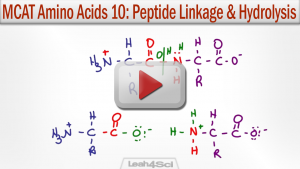 This video walks you through the formation of an amino acid bond – the peptide bond, as well as breaking the bonds through hydrolysis.